From the Land of 10,000 Lakes comes legends like Harmon Killebrew, Kirby Puckett and Rod Carew. Celebrate these icons and your hometown team with Personalized Family Cheer Minnesota Twins Wall Art from PersonalizedThings by Exposures. 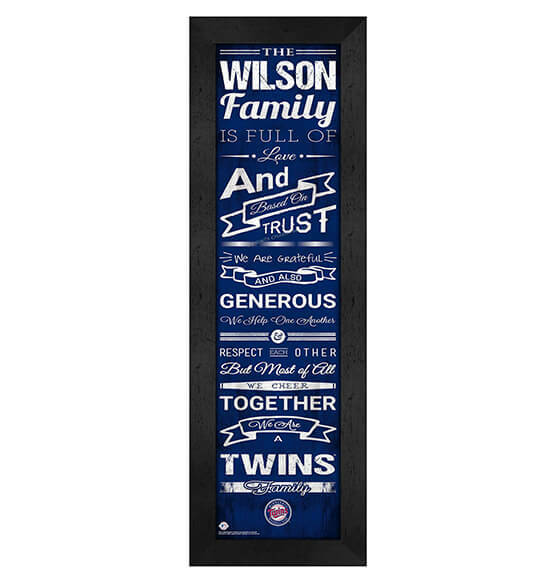 This vertical-hanging wall art features charming sayings that celebrate your love of family while commemorating your beloved Twinkies with vibrant team colors and the iconic Twins logo. It also comes with a sawtooth hanger for easy decorating with our MDF vinyl-wrapped sports decor that's safely mounted behind glass for long-lasting beauty. Easily customize this wall art with your family name or give it as a thoughtful gift for birthdays, anniversaries or holidays!